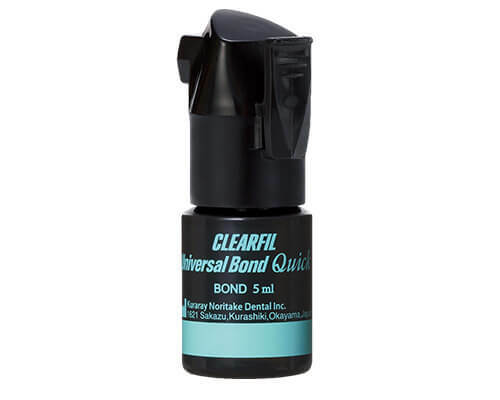 CLEARFIL Universal Bond Quick is a single-bottle, fluoride-releasing, universal adhesive with the new original MDP & AMIDE-based chemistry that provides a unique RAPID BOND TECHNOLOGY. This new AMIDE monomer rapidly permeates dentin & enamel which eliminates waiting time & dramatically reduces water absorption. 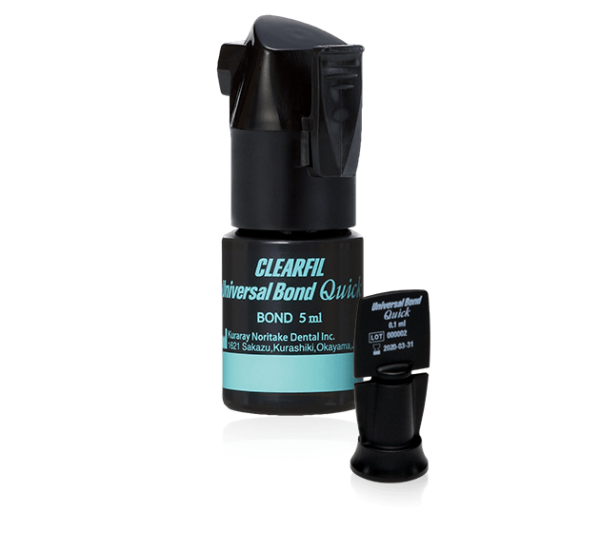 It also reduces technique sensitivity & application time without compromising bond strengths, sealing or desensitizing. It’s indicated for use with all etching techniques and light, self or dual-cure materials. 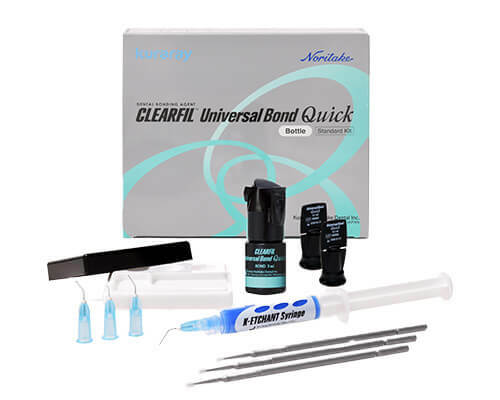 CLEARFIL Universal Bond Quick offers your practice versatility since it directly bonds to dentin, enamel, metals, zirconia and lithium disilicate restorative materials. CLEARFIL Universal Bond Quick can be mixed with CLEARFIL DC Activator to become a dual-cure adhesive, thereby making this product truly “Universal” for all etching and restorative needs. Universal Use: Can be used for Total-etch, Self-etch and Selective-etch techniques. New original MDP & AMIDE-based chemistry that provides a unique RAPID BOND TECHNOLOGY. No additional primer or activator is needed when used with CLEARFIL DC Core Plus/PANAVIA SA Cement Plus. 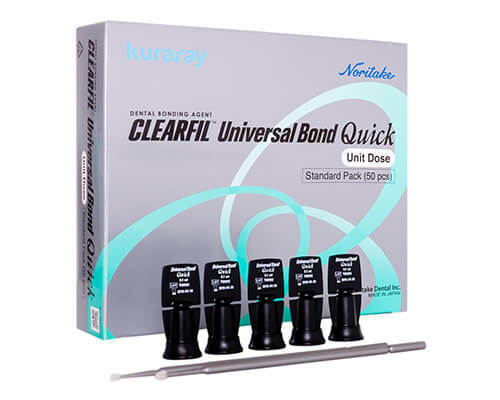 Bonds to zirconia, metals and silica-based ceramics including lithium disilicate. Works on both wet and dry dentin when using the total-etch technique. No waiting time in both the total-etch and self-etch modes. Can adhere to any material w/o additional primers; no need for separate silane coupling agent. Direct restorations using light-cured composite resin. Cavity sealing as a pretreatment for indirect restorations. Treatment of exposed root surfaces. Intraoral repairs of fractured restorations. Post cementation and core build-ups. 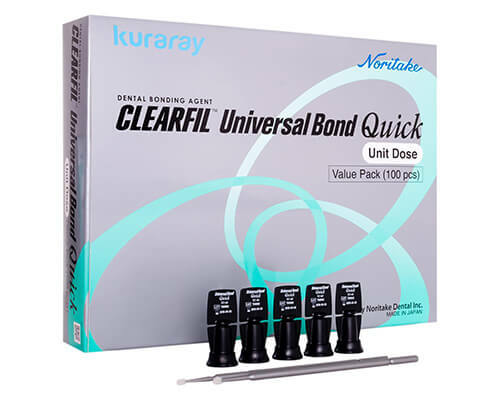 Cementation of inlays, onlays, crowns, bridges and veneers.